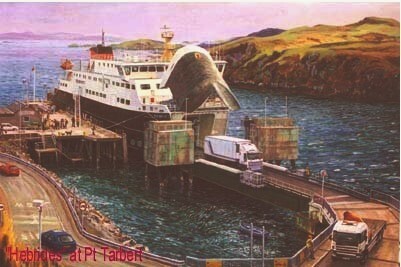 I was specifically asked to find an unusual way to show ‘Hebrides‘ at work hence this study of the ship unloading. “There is an enduring quality, capturing an aspect of our now for future generations, great painting.” said Capt J A B Simkins, Managing Director, Caledonian MacBrayne . 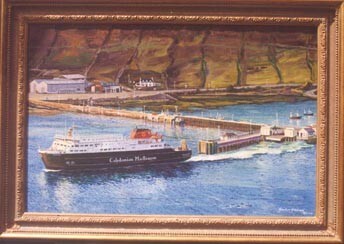 The Princess Royal, Princess Anne, who had previously named Calmac’s “Clansman”, and at that occasion seen and admired the painting, Clansman arriving at Castlebay, Barra and spoken with the artist, suggested to the Calmac directors, Gordon Frickers do more work in the Outer Hebrides, the Western Isles, an area she knows well & loves. Following their success with The Clansman arriving at Castlebay, Barra painting which had been from Calmac’s view point been a very successful commission, completely problem free and with a royal recommendation he Calmac directors again chose this artist for their new ship ‘Hebrides’, not a difficult choice. Their MD, Captain J A B Simkins, simply described the artist as “very professional“. Are you going to miss your chance to acquire this very original painting or commission a similar painting or print?